Sridev Suman Uttarakhand University is a new University in the Uttarakhand state. And from this year this university is organized the private examinations for the courses which are B.A 1st year Private, B.Com 1st Year Private, M.A 1st Year Private and M.Com 1st year Private. Before this university all the given examinations was organized by Hemwanti Nandan Bahuguna Garhwal Central University. But now this session of 2012-13 examinations for given courses is conducted by the Sridev Suman University. The Headquarter of the Sridev Suman University is Badsahithol Tehri Garhwal Uttarakhand. 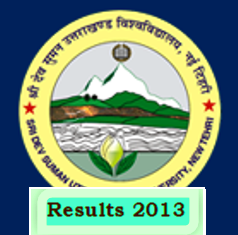 So as on given post I am telling you about the results of Sridev Suman Uttarakhand University. The results of the University will come soon, and it will update as soon as possible by the University then we will also update the results. But here below I am also giving you a link to get your results online. So when the university updates all the results then you can also get the result from here by the given link. I know there so many of the students are waiting for their results, but when it will update then you can check here and the link will be alive. I wish you all the best for your results. For more details check the website of Sridev Suman Uttarakhand university: - http://sdsuv.ac.in. Click here to get your results online. For more updates of exams and result stay connected with our site or you may also subscribe us by email. HI Anil as you are doing MA i want to know what is the eligibility for doing MA(private) in English please let me know. B.A FIRST YEAR PRIVATE RESULT DECLARED OR NOT. AND IF NOT THEN PLEASE REPLY THAT WHEN IT IS ABOUT TO DECLARE. dir sir ba 1st year private ka result kab ayega? when will delare BA 1st year result,,,,? plz reply me,when updated ba1 year private exam result of sri dev suman university. sir plz tell me M.A. private sociology result kab update hoga.